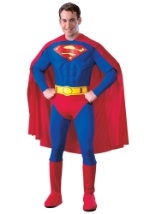 Transform into an American icon this Halloween season in this authentic Superman costume. The plus size costume consists of a blue jumpsuit that ties at the back of the neck for closure. The foam, molded chest gives the appearance of muscular definition and proudly displays the Superman logo. A yellow, foam belt tops off the attached red briefs and red boot covers are sewn on to the bottom. A red, flowing cape ties around the neck and completes this superhero costume. Really impress your friends by adding our bendable steel bar or pull apart chains!